In this most splendid, least-humid summer of my fairly long lifetime, I’ve been pulling weeds, printing, & thinking of you. I’ve also been heartened to see Monarch butterflies wafting around the common milkweed plants that are finally blooming in our backyard. 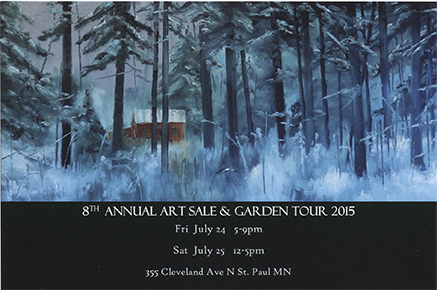 Please join me this Friday & Saturday, July 24 & 25, 2015, at my favorite outdoor art-related event: the eighth-annual art sale & garden tour hosted by Paul and Susan Damon. For more than 20 years, Susan & Paul have planted native plants and tended the corner lot that surrounds their sweet Craftsman home. Their garden is now a designated Monarch Waystation—#447. Last year butterflies, bees, and other pollinators joined guests as we all flitted around and admired our surroundings. There will be plenty of art to admire, too. On exhibit and for sale will be Paul Damon’s oil paintings, watercolors, and drawings. http://pauldamonlandscapes.com/ Paintings, collages, and mixed media by Liz Carlson will also be displayed and for sale in the Damon’s home. You can view Liz’s work on Facebook and Twitter. You will find me in the backyard, in the welcome shade of the garage, where prints and note cards will be for sale, and where you can print a leaf selected from the Damon’s bountiful gardens. We’ll be using Speedball water-soluble printmaking inks and printing on the Sprinkle Gold Oriental paper I learned about from Liz—and purchased at Wet Paint! If Paul and Liz’s names are familiar, it may be because they’re longtime staff members at art supply shop Wet Paint, located on Grand Avenue in St. Paul. I met Liz and Paul while shopping there and am thrilled to join them in this annual event. Please pack your car with your artistic, horticultural pals, or gather on your bicycles, and stop by! I look forward to seeing you! One of Paul Damon's paintings on a postcard invites you to the 8th-annual art sale & garden tour hosted by Paul and his gardener wife, Susan.